Pojo's Megaman news, tips, strategies and more! Tuesday, May 17, 2005 Well, the Megaman TCG is officially dead. We will be not be updating this section of Pojo.com anymore. Thanks to all the folks who did Card of the Day here, and submitted tips. You just never know what games are going to catch on. Sadly ... this one didn't. :-( Thanks to Secret Squirrel for sending us the link to the news. Wednesday, May 11, 2005 Asakura Yoh sent in some Video Game Tips that we posted for you. Wednesday, January 09, 2005 We got a couple TOP TEN's in to entertain you. Things have slowed down a bit here with Megaman stuff. Feel free to join in and contribute card reviews, top tens, tips. This forum is open to all. Friday, January 06, 2005 A couple more fun TOP TEN's were posted as we wait for our card reviewers and such to get themselves geared up for the new year. Tuesday, December 28, 2004 The holidays bogged down a bit for Megaman, but we had another TOP TEN submission so we posted it. Come on and send in some tips or whatever you might think of this new game. We'd be happy to hear about it. Monday, November 29, 2004 We're getting back to our card review stuff as we clear a few busy things off our schedules and come back from holiday break. In the mean time, our reader submitted TOP TEN's picking up steam. Join in the fun. Let us know what you think. Monday, November 01, 2004 Our card of the day is a AirMan, Ready to Blow from Grand Prix!. tcorbett has a review today. We also have some new TOP TEN's for you today. Friday, October 29, 2004 Our card of the day is a WackoMan, Whimsical from Power Up!. Otaku and tcorbett both have reviews again today. Wednesday, October 27, 2004 Our card of the day is a Roll, Hip and Cool from Power Up!. Otaku and tcorbett both have reviews again today. DURT DUR DA DURRRRRRRR! That's a trumpet sound in case you're wondering. And, rightly so, because we're announcing our FIRST Megaman TOP TEN and Mega Yammers submissions! ASinger806 entertains us with his version of the top ten Hottest Megaman cards, and, Otaku, one of our card reviewers, brings us a NetNavi yammer! Monday, October 25, 2004 Our card of the day is a NumberMan, Calculator from Power Up!. Otaku and tcorbett both have reviews today. Friday, October 22, 2004 Our card of the day is a MagicMan, Riddler from Grand Prix. Otaku and tcorbett both have reviews today. Thursday, October 21, 2004 Our card of the day is Gutsman, Body Strength from Power Up! tcorbett has a review today. We could use a few more dependable Card of the Day people. If you play this game, and are interested in helping out, contact us. We have some Megaman NT Warrior TCG Grand Prix Theme Decks to give away! Our friends at Decipher sent us a couple of handfuls of product to give out to lucky Pojo fans. We are looking for Top 10 Lists, Tourney Reports, or General Tips. We'll run this contest until the end of the month. After Halloween, we'll pick a handful of winners at random from those that contributed. Wednesday, October 20, 2004 Our card of the day is ElecMan, Fully Charged. Trunks The Swordsman and tcorbett have reviews today. Friday, October 15, 2004 Our card of the day is a Falling Object from Grand Prix. Scott Gerhardt and tcorbett both have a review. Thursday, October 14, 2004 Our card of the day is a Petrify from Grand Prix. tcorbett has a review. Wednesday, October 13, 2004 Scott Gerhardt has his weekly article today, entitled, High Dollar Hijinks as he looks over some of the things bothering him about the game. Mega Man Zero 3 Released for Game Boy. Details on Planet Gamecube. Tuesday, October 12, 2004 Our card of the day is a Pharaohman from Grand Prix. Scott Gerhardt, Otaku and tcorbett both have reviews. Friday, October 8, 2004 Our card of the day is a Recharge And Try Again from Power Up!. Scott Gerhardt, tcorbett and CyberToast. Thursday, October 7, 2004 Our card of the day is a AreaSteal from Power Up!. Scott Gerhardt, tcorbett and CyberToast. Wednesday, October 6, 2004 After some technical glitches with our article last week, Scott Gerhardt is back this week with his AirMan deck article entitled A Lot of Hot Air. Check out what he has to say about it. Monday, October 4, 2004 Our card of the day is a Promotional card. Otaku and tcorbett have reviews for the big guy himself, MegaMan, CyberHero. Friday, October 1, 2004 Yesterday, Terry Corbett helped a reader fix his deck. Now Terry is officially opening a Deck Garage. If you are in need of a little assistance, feel free to write Terry at pojoterry@yahoo.com. Our card of the day is another Brand New one from the Grand Prix set. Scott Gerhardt, tcorbett and CyberToast have reviews for Geddon3. 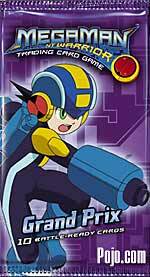 Thursday, September 30, 2004 We have another special Megaman card of the day review from the Grand Prix set. This is a Brand NEW card. tcorbett, CyberToast and Scott Gerhardt give us reviews of Full of Hot Air. We got an email from a fan that wanted help with his deck. tcorbett decided to take a shot at fixing up Stuart Hayden's Protoman deck. Wednesday, September 29, 2004 Our Megaman card of the day is AreaSteal - Power Up! tcorbett has a review today. Tuesday, September 28, 2004 We have a special Megaman card of the day review today with Ultimate Sacrifice from the Grand Prix set. Very few people even have this card yet, but our people at pojo.com snagged one. Scott Gerhardt and tcorbett give us their reviews. Monday, September 27, 2004 Our card of the day is Cancelled. No, I don't mean the card is cancelled, I mean the Card is "Cancelled" -- well, you'll figure it out. Scott Gerhardt, CyberToast and tcorbett give us a review today. Friday, September 24, 2004 Our Megaman card of the day is Method for Well Being. Scott Gerhardt, Otaku, cecillbill and tcorbett give us their reviews. Thursday, September 23, 2004 We got our hands on the Spoiler for the Original Power Up set. The spoiler is very detailed and in Excel Spreadsheet format. The link to the spoiler is in the left margin, and right here. The first expansion for the Megaman TCG will be "Grand Prix". It will release Wednesday, September 29th. Decipher has been giving sneak peeks at this set on their site. We added Megaman Forum to the Pojo.com Message Board today as well, if you want to discuss Megaman with fellow Pojo-ers. Wednesday, September 22, 2004 Welcome to our new Megaman Site. We figured we'd try something new. We haven't delved into a new TCG since April, and thought it was time to break some new ground. Decipher has created a New Megaman Trading Card Game, and some of our staff have taken it for a test run and think the game is plenty fun. So, we here at pojo.com figured we'd open this baby up and get in on some of that Megaman action. Our very first card of the day for Megaman is WideSword. Our reviewers Scott Gerhardt and cecillbill get us started with their take on this card. We also have a Featured Article by Scott Gerhardt, a multiple Magic the Gathering Pro Tour Player, examining the next expansion set for Megaman. In this article, Scott gives us his breakdown of the set Grand Prix. It's a brand new game, so you better get started. Check this game out and start coming up with those tips, tourney reports, and top tens. We'd love to hear from you!